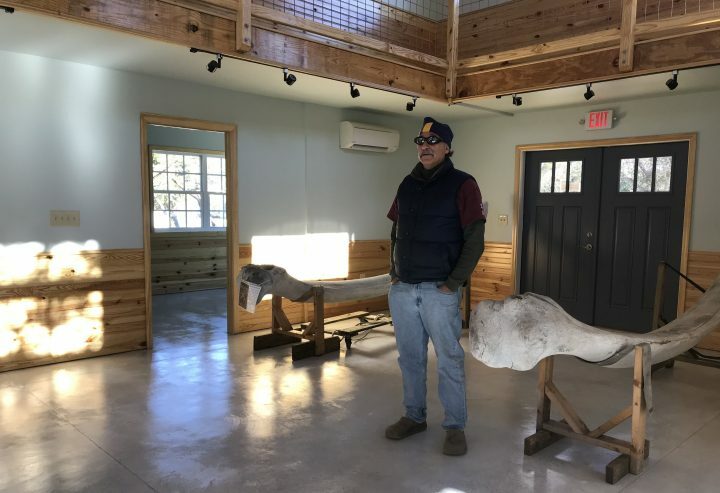 BEAUFORT – Construction is nearing completion of the Bonehenge Whale Center, a workshop and museum in a gorgeous new building nestled in a grove of trees at 275 West Beaufort Road. According to its director, Keith Rittmaster, natural science curator at the North Carolina Maritime Museum in Beaufort, the building passed an inspection by the town in mid-January and has a conditional occupancy permit, and that’s a good thing, for sure. Rittmaster has to move all of the trappings of years’ worth of work, including partly reconstructed marine mammal skeletons, out of a trailer about a football field’s length away by April and into the new building. The conditional permit allows that. After showing a reporter the new building, then walking over to the trailer, then heading back to the soon-to-be Bonehenge building, Rittmaster was carrying stuff. But what a building it is, and what a whale of a tale of community spirit Bonehenge is, both in terms of the marine-mammal-loving Carteret County community at-large and its marine science community. The center all has been paid for with donations, and even the general contractor, Vic Fasolino, donated his time, using volunteers to do much of the work. To date, volunteer monetary donations have reached $240,000 in a little more than a year. Recently, a stainless steel refrigerator, an oven and other kitchen equipment just showed up and fit perfectly into the kitchen, donated by Cape Carteret resident Helen Aitken and her husband, Scott. The aptly named Bonehenge is to be a home base for research, exhibit preparation and display, marine conservation, educational programming, outreach, publications, and stranded specimen collection and maintenance that focuses on North Carolina cetaceans or aquatic mammals. Rittmaster and others who will work there on projects specialize in “hinging” back together marine mammal skeletons, many from animals stranded on local beaches, for display in various locations, including the Maritime Museum, state-owned Jennette’s Pier in Nags Head and eventually Bonehenge itself. 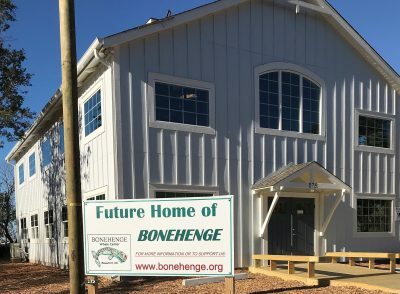 The term “Bonehenge” was conceived in 2009 to represent a volunteer-built pole barn, a fundraiser and a website dedicated to the bone preparation and skeletal re-articulation of a 33.5-foot-long male sperm whale that stranded and died at Cape Lookout in January 2004. That skeletal display, named Echo, was completed in March 2012 after years of painstaking work by Rittmaster, and is on display at the Maritime Museum. But the new Bonehenge building is a far cry from that volunteer-built pole barn. The two-story building, a full bottom floor and a sort of loft with a walkway that looks down through open space to the first floor, is full of intricate detail and fine craftsmanship. It has a nautical feel, with the interior paneling made of pine siding, and it has warm lighting from windows and a cupola. It will be a comfortable place for the researchers, visiting students and “bone-hingers” as well as a warm and inviting place for the public to see the displays of marine mammal skeletons and other related items. 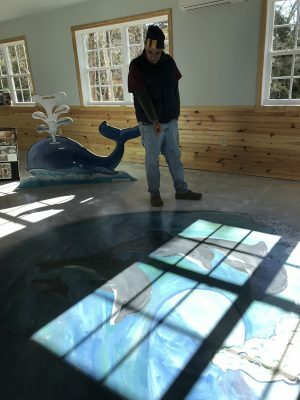 When the building is ready for the public – after water and sewer service arrives via the town of Beaufort – visitors will enter through an archway made of the mandibles of a 46-foot Atlantic right whale that stranded on March 27, 2011, in Nags Head. Like everything else that will be in the building, those mandibles represent a teaching moment. Right whales have been hunted nearly to extinction over the past centuries, and a necropsy revealed that this one had been entangled in line and had been hit by a ship. “We want to tell people about the need for conservation of marine mammals, and about the things that threaten their existence,” Rittmaster said. Once through the mandible archway, those who visit will walk across a floor painting by Nan Bowles of Beaufort depicting four dolphins native to the nearby waters: Butterfly, Onion, Fringe and Fringe’s calf, Frankie. It’s another teachable moment, this one about how researchers identify and track dolphins through photos. And because one of those dolphins died and was found with plastic in its stomach, it’s also an opportunity to teach about the incredible amount of plastic in our waters and the threat plastic poses to marine life. One display in Bonehenge will be the skeleton of Capt. Morgan, a dwarf sperm whale that stranded at Morgan’s Creek Landing in Beaufort. 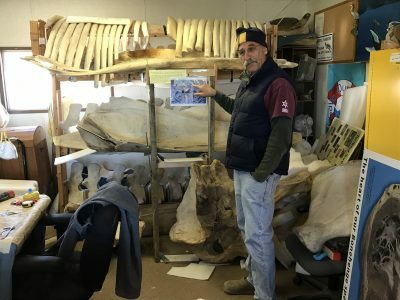 The dwarf sperm whale is an offshore species, Rittmaster said, and the skeleton he put together has been on display at the Trinity Center in Pine Knoll Shores. Another will be the skeletal re-articulation of a 37-foot female humpback whale named Pitfall. In 2001, at the age of 3, she was hit by a large ship and washed ashore in Massachusetts. Rittmaster was offered her remains and said yes, despite not having anywhere to display them at the time. Once the skeleton is finally assembled, Pitfall will hang from the exposed beams inside Bonehenge. The public will be able to touch things in Bonehenge, such as whale baleen. That’s something Rittmaster is excited about, because touching helps people make a real, indelible connection to marine life. The opening to the public, however, isn’t likely anytime soon, and will be by appointment when it happens. That’s because Rittmaster is the only staff member and he has other responsibilities. Rachel Johnson, public information officer for the town, said water and sewer service can’t be extended to the Bonehenge building until the facility is in the town limits; it’s just outside. To do that, Bonehenge would have to request voluntary annexation. Rittmaster said that’s in the works. 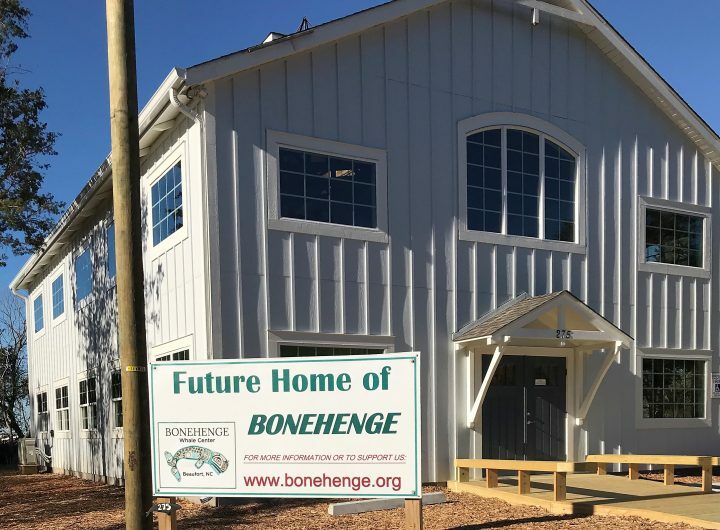 Bonehenge is affiliated with the Maritime Museum, through an agreement between the museum and the nonprofit organization, Carolina Cay Maritime Foundation, formed to raise the $33,000 to purchase the building’s site and the additional amount build the facility. Rittmaster is still employed by the museum as a curator, but he also is director of Bonehenge. He said he was advised from the beginning that it would be a long and arduous process to make Bonehenge a reality if he and the others involved sought to make it a state project. State involvement necessitates countless bureaucratic hurdles not only for property acquisition, but also for construction. Now 62, he grew up in Princeton, New Jersey, and certainly never expected to wind up putting together dolphin and whale bones. It all changed in 1975, when Rittmaster, then 18, moved to Buxton on the Outer Banks. He started surfing among dolphins and saw his first whale stranding. It was a life-changing event. He eventually met his wife-to-be, Vicky Thayer, the central coast marine mammal stranding coordinator for the Marine Mammal Stranding Network, in graduate school at Duke University. Since 1985, Rittmaster, Thayer and others have collected bottlenose dolphin fin photos. Rittmaster said around 4,000 photos, representing about 1,200 dolphins, have been added to an online database that allows people to help match the fin photos, and in turn, lead to discoveries in bottlenose dolphin migrations, associations, genetic stocks and birthrates. Federal fish biologists use it to learn about the genetic pools of bottlenose dolphin populations. Bonehenge is a natural extension of that work. Already, researchers and staff from the Duke University Marine Laboratory in Beaufort, the Maritime Museum, Cape Lookout National Seashore and North Carolina State University’s Center for Marine Science and Technology in Morehead City have said they want to work in the building. In addition, thanks to a system that will allow entry to the building with one-day unlock codes, Rittmaster plans to make the facility available to volunteers and students who want to do research. There’s a room that will be equipped with a computer, stainless steel tables and seating for that purpose. Fundraising continues for Bonehenge, with a goal of $300,000. Rittmaster said money is still needed for tools, cabinets and other necessities for great work and research. To donate, visit the Bonehenge website.